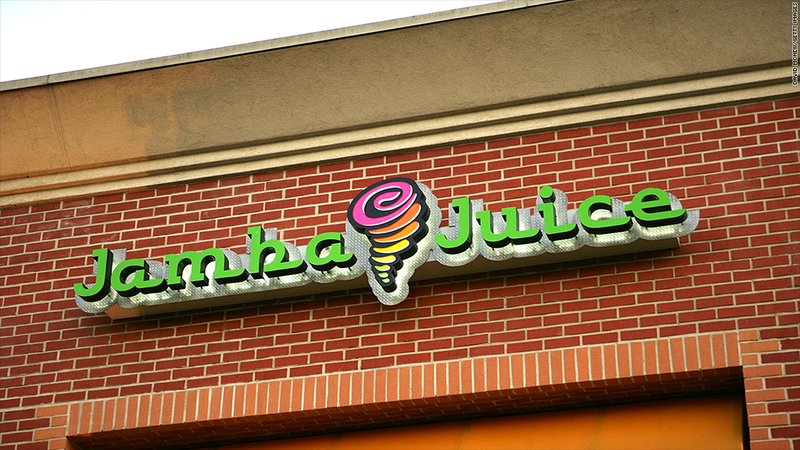 Jamba reported strong earnings and plans to roll out 'superfood' juices nationwide. Things are getting even juicier for Jamba (JMBA) where a new product is doing so well the company is taking it nationwide next year. The new juices, introduced earlier this year in California, take advantage of popularity for new "superfoods" like kale, chia seeds and beets. To promote the push, Jamba's giving away its fresh juices in about 600 locations Wednesday. "We believe this initiative is our most significant platform launch in company history and will accelerate our growth for years to come," said Chairman and CEO James White, during a conference call with analysts Monday to discuss its stronger-than-expected earnings. Jamba's stock rose more than 11% Tuesday following the results. The new juice lines, which are helping to accelerate growth, are part of an overhaul for a company that's been making smoothies for almost a quarter of a century. White brushed aside concerns that Jamba will face increasing pressure from competitors who are introducing or expanding smoothie offerings and other healthy drinks. "Whether it's Starbucks (SBUX) or McDonald's (MCD) or any of the other folks that have over time launched smoothies, everybody has a smoothie," he said. He reserved especially sharp words for the coffee company from Seattle. "Starbucks has been in this space for four years or five years and they've underperformed pretty significantly the Jamba offering and we expect that nothing will change there," he said. "We're pretty confident with where we'd line up versus any competitor."